The 5 W's of Thrift Shopping: WHEN? The 5 W's of thrifting are who, what, when, where, & why. This post will focus on the the question of, 'when is the best time to go thrifting?' Using real life examples I will break down the importance of shopping at particular times while sharing a few tips. There are really only a few cases where the season affects the opportunity for thrifting, the first of these being garage sales. Garage sales generally only take place from approximately March-October. Cold weather & rainy days do not lend themselves to good customer traffic & therefore enjoying garage sales is generally limited to only a few months. Because of this I often visit garage sales heavily during the summer (The A to Z of Garage Sale-ing soon to come!). The limited shopping/selling window + folks desperation to clear out their old things makes for great low prices & endless possibilities when it comes to what you may find. The second major example where timing can really benefit you is when stores offer specific discounts or promotions based on the day of week or time of day. Once you begin to find thrift shops that you like, ask the employees if they offer any sort of further discounts when shopping on specific days. Many chain & small local shops implore this method to boost traffic on slower days. After you've become aware of any existing specials you can base your thrifting schedule around those days in order to save the most money possible. This method has become so valuable to me, I shop at a Salvation Army that offers 50% on one color tag each day. 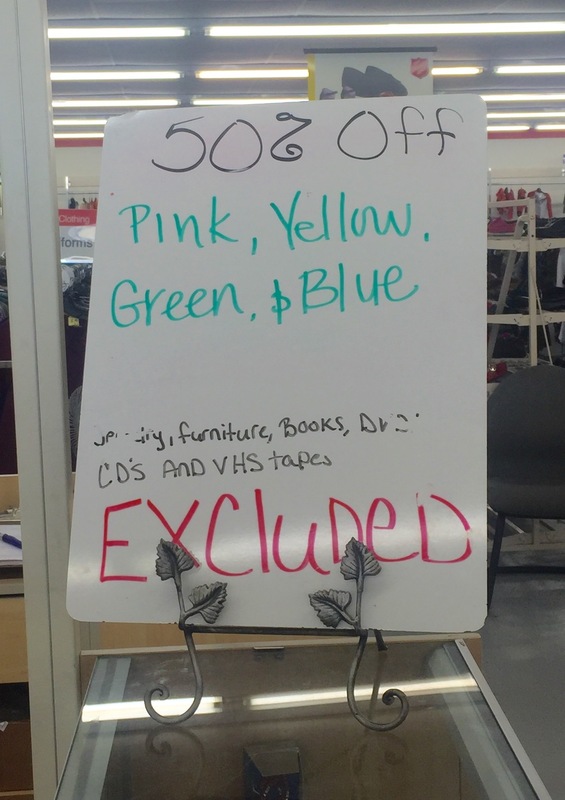 On Wednesday however, every color receives 50% discount applied to it. This is a major benefit that many of the store's regular shoppers aren't even aware of. As consumers of new or thrift merchandise it is our own responsibility to be diligent & make intelligent decisions when it comes to our purchases. On my last Wednesday visit I spent $40 on over $100 worth of goods! BONUS TIP: It's also worthwhile finding out when new merchandise is put on the floor. Shops generally follow a regular schedule & having first pick of the new goods can be the difference between securing an amazing vintage piece or not. I can't tell you how many times I've been the subject of envious stares while having vintage trunks, tobaggens, globes, etc. in my cart that I was the first to grab because I knew the product flow schedule.